VACUUM PUMP FOR SEMI AUTOMATIC CAPSULE FILLING MACHINE . The semi automatic capsule filling machine is made out as per GMP standard suitable to fill powder, granules and pellets in empty capsule .The stand of body is made out of mild steel clad by S.S 304 quality The covering of the body is made out of S.S 304 quality mate finish and the top covering is made out of S.S 316 quality mirror finish. 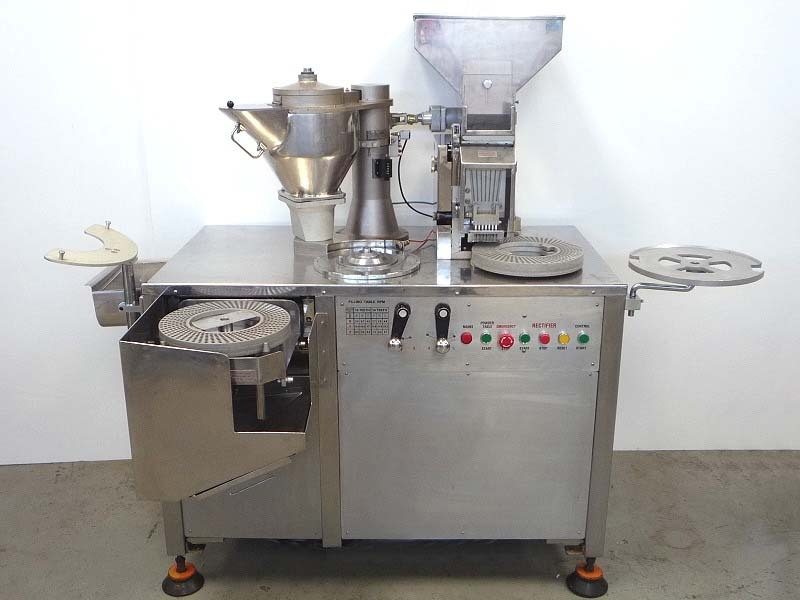 The drug hopper is made out of S.S 316 quality with starrer and auger made out of S.S 316 fitted in drug hopper to fill the powder inside the empty capsule the movement of drug hopper is function with pneumatic cylinder the drug hopper drive with means of 1 H.P 3 phase electric motor and the filling table drive with means of ½ H.P gear motor 3 phase electric with variable speed drive. All the above output is depending on formulation and operator skill. 2) VACUUM PUMP FOR SEMI AUTOMATIC CAPSULE FILLING MACHINE. The hopper of the loader is fabricated and made out of S.S 304 quality the loader section is made out of brass & aluminum duly hard chrome plated & anodize with aluminum loading ring. The loader drive with the means of ½ H.P 3 phase electric motor. The drug hopper is made out of S.S 316 quality with starrer and auger made out of S.S 316 fitted in drug hopper to fill the powder inside the empty capsule the movement of drug hopper is function with pneumatic cylinder the drug hopper drive with means of 1 H.P 3 phase electric motor and the filling table drive with means of 1 H.P gear motor 3 phase electric with variable speed drive.